Did Livi and Alloa require the services of a Sports Scientist in our recent matches with them? Of all the ways available to put a better team on the park is this a justifiable expense for a championship club? I have an open mind. JR may be laying the foundations for his dynasty & St Mirren coming to the fore on Scottish football. If it's affordable, give it a try, if it doesn't work, think again. If it does work & we do well in the league, it'll be money well spent. You'll cheer just as loud as any happy clapper. It's not affordable if we have to get money from SMISA. The SMISA money is there to be spent. Whether that be on community, club or fan experience is subject to debate. For me betterment of our club comes first. Should not just spend money willy nilly. Save it for a few years. Wow be careful Shull! I don't want to have to agree with you on something! I can see the merit on spending it on something like this but I also think there should be an option to save the money for down the line. Would have to look at the different proposals to make up my mind and the opinion of the club. Excuse my stupidity, but what does a Sports Scientist do? Is it a consultant who provides a service to St Mirren and other football clubs / organisations? Is it part time? Full time? On a normal day, a Sports Scientist attending Ralston - what do they actually do? Edit: How were Fitzpatrick, Stark, McGarvey & Co so goddam' good when they probably only saw a guy with a cold sponge and ran around some cones with a ball midweek? Its the power of a vote heavily weighted towards the club's shopping list, rather than options put forward by those ponying up the money! How about an option to open the North Stand for away supports. Even half of it. How about a swear box? That'll be a pound sir.....................SMISA will be rich very, very soon. Doesn't say anything about an increased awareness of how to break down stuffy, well organised diddy teams or how the idea is to pass the ball to another guy wearing black and white stripes. Waste of fecking money then? It isnae oaky is it? C'mon fellas lets stop dicking around with a geeky Sports Scientist and adopt this tried and tested avenue to fulfilment. i remember when Hoddle brought her in to work with the England squad, he started her on the ones more likely to be open to her 'powers' then it was Ray Parlour's turn to sit in the chair..
Eileen: "now then, what can I do for you?" Parlour: "short back and sides please"
As I've said before, it's not us and them. 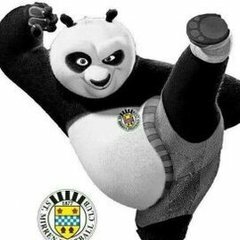 I don't see why people can't see that the people running our club will have the best interest of St Mirren football club at heart. You'll need to explain this to me then. Another poster listed some options that the SMiSA 'float' could be voted on. I then suggested another option to be voted on could be using the money to pay, or help pay, the costs involved in stewarding / catering / opening the North Stand for away fans, as an alternative to shoving them into an unsegregated South Stand. I don't get your point here. Happy to hear an explanation. Sure my understanding is it would only really come into effect in cup games and maybe against Dumbarton or Brechin who will take small supports and may be put in the family stand. I don't see any issue with cornering off a bit of that stand because it's never close to full (didn't agree with the mixing they did on Tuesday) So IMO it's a complete unnecessary waste of money for such a small impact when we could use it on other aspects of the club. Not something the SMISA money should impact, the placing of fans should remain a club decision. Because we pay £2 a month into a fund doesn't mean we should have the right to question how they police the ground. If we want three stands with all St Mirren fans in it then we need to increase attendance numbers. We can't moan about it if that stand is only having a couple hundred per games. Segregating a stand happens in lots of football stadiums, don't see the big deal.